Achieving an outstanding signal to noise ratio, ultimate clarity and a purity of sound. TechDas Disc Stabilizers are designed to eliminate the micro vibrations that are inherently created on a vinyl by the stylus tracing the groove. Although there are a lot of stabilizers in the market for audiophiles to reduce vibration on an analog record or prevent warped records, most of them only clamp down records with a large mass. Such a solution may reduce vibration energy somehow but cannot eliminate micro vibrations. 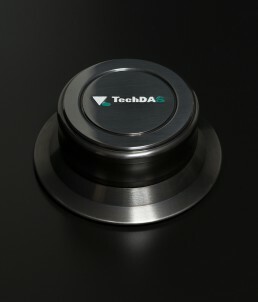 TechDAS has strived to create an ideal stabilizer focusing on the outstanding characteristics of tungsten, such as sound absorption, sound velocity and hardness. The sheer result is the TechDAS Disc Stabilizer Ultimate – Tungsten. 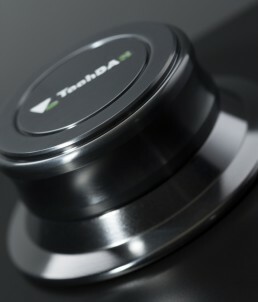 The TechDAS Disc Stabilizer Ultimate – Tungsten uses tungsten for the body, a material that has excellent audio characteristics, thanks to the highest level of hardness, vibration absorption and mass of all metals. This product allows to absorb the micro vibrations on an analog record, which will lead to maximizing the traceability of the stylus. • A static removal sheet is attached to protect the disc contacting surface.